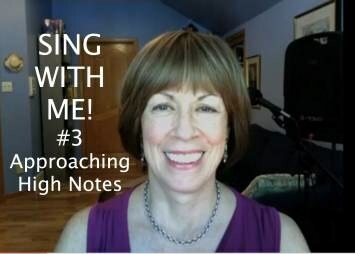 A Singing Exercise to Prepare for High Notes - from the "Sing With Me" Series. Watch this SINGING EXERCISE VIDEO for two vocal exercises that will help you to approach your high notes with greater ease. 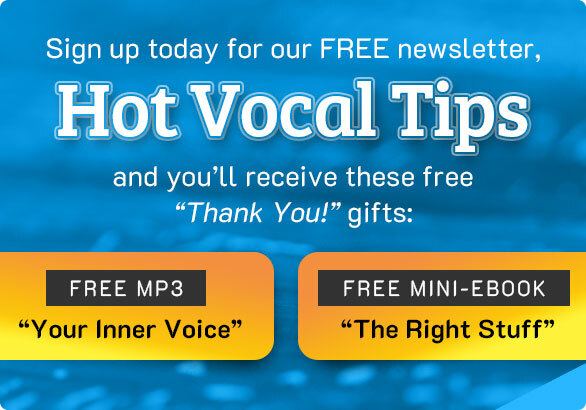 The is #3 in the free 9-part series of vocal warm-ups called, "Sing With Me!" The first exercise is the "EEEEE" stretch. It is important that this exercise be done smoothly with a firm EE vowel in your throat. You speak the EE. And from that spoken place, you stretch the sound with your breath. This singing exercise is much easier to do when you simply copy the demonstration without too much thought, at first. Approach it in a playful way - no pushing - no strain. You mimic "singing" the stretched "EE" just as a child would mimic a siren sound. The EE-stretch exercise can take you through your entire range with ease. You may be surprised when you go to the piano (guitar?) to discover just how high you are able to sing with an exercise like this. Keep in mind that you will open your mouth as wide as the note requires for the upper range, while continuing to sing EE. Singing into your upper range in this way, without forcing or straining, teaches your singer's ear that you can make those upper range sounds with freedom. But don't go higher than is comfortable. Take your time. Be patient. It's important to not push the sound. Ideally, it zips along from a firm vowel - with firm breath. I have been video-recorded with a very tight, close up shot so that you can see the correct tongue position. My tongue stays quite low as I move into the upper range. Also, with the EE vowel, you will likely have a natural, easy "smile" on your face as you sing. For many singers, this "inner" smile helps you to move more easily into the upper range. The second exercise is called, "BUBBLE LIPS." Many singers and many teachers use this singing exercise, so you may already know it - but with another name. Again, here is a wonderful, playful exercise that takes you, without strain, through your entire range. But keep in mind that with both of these exercises, you are NOT really singing those high notes - not yet. You are simply stretching or "bubbling" to them. Over time, with other exercises, you will learn how to sustain the upper range. For now, just enjoy hearing those notes coming from your amazing voice! Again here is the VIDEO DEMONSTRATION.